I was going to title this post "Winter, My Nemesis", but it really has nothing to do with winter. I simply have strong, negative feelings about winter that sometimes manifest themselves in mildly inappropriate ways (like shaking my fist at a snowing sky or beating up skiers for lunch money). Fortunately, winter has so far been mild where I am. It has been snowing primarily in the mountains like God intended. This means the lowlands are mostly easy to navigate, we'll have water next year, and those people who've invented many ways of sliding down snow covered hills have an outlet for their strange and unnatural passions. My main motive for buying the van was that I thought I was some sort of nomad, and the ability to throw all my possessions in my vehicle and just go whenever I pleased appealed to me. I've only recently realized I'm not much of a nomad, and I've only run off to nowhere a few times, and the last time I did that was a while ago. So, my van is almost always entirely empty except for the sandbags I carry around during the winter. 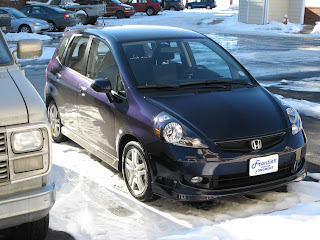 I decided to go in a more efficient direction with my new car and picked up a Honda Fit. Everybody that sees it seems to be concerned with whether I fit in the thing. 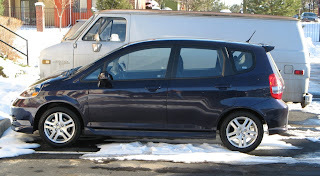 Actually, I fit just fine (unlike the Toyota Corolla I test drove). It is quite comfortable and is a little easier to get in and out of than the El Camino was. (It's not fair to compare the Fit to the van in this case, because, for me, the van is the easiest vehicle I've ever gotten into. I practically just walk into it.) Honda has done a remarkable job of making use of the available room. Of course, thinking about it now, the Fit is nearly form fitting for me. It's comfortably snug while I'm wearing my normal winter clothes. I guess I'll just have to watch my figure. People have requested some pictures. 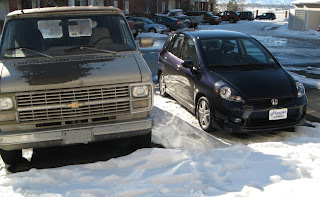 So, I took some with the Fit next to my van for comparison. I've only had it since Wednesday, but I've been enjoying it (especially the maneuverability). It seems well designed and well engineered. I don't know what a person who drives a "luxury" car would think about it, but it feels downright luxurious to me. Luxurious to the point I feel a little guilty about it and worry that I'm going soft. I mean, it has AM and FM! Of course, for nine years I have been driving a noisy, metal box whose main redeeming feature is that the heater does work. So, my perspective may be a little different from other people's. Now that I've been driving this car, I do wonder that if recent cars hadn't become so comfortable and well engineered, whether the nation's average commute time would have continued increasing. Think about it. If you hated driving your vehicle like I did, you'd want to limit how much time you spent in it. I know I did. Maybe instead of mandating better fuel efficiency, congress should mandate less comfortable cars. I bet that would have a greater impact on driven miles and gas consumed than any fuel efficiency standard! Okay, maybe not.